I had maple bacon salted caramels yesterday. Very tasty but I have to admit no maple and no bacon flavors. Disappointing. Zoomie, I got crickets. Say the word. Did you name yours Jimmy before you sampled? Yes, I had gotten the reference to crickets, hence the "eek!" I'm betting caramels are better. Three Dogs BBQ, That would be the name I would pick if I named crunchy cricket carcasses. 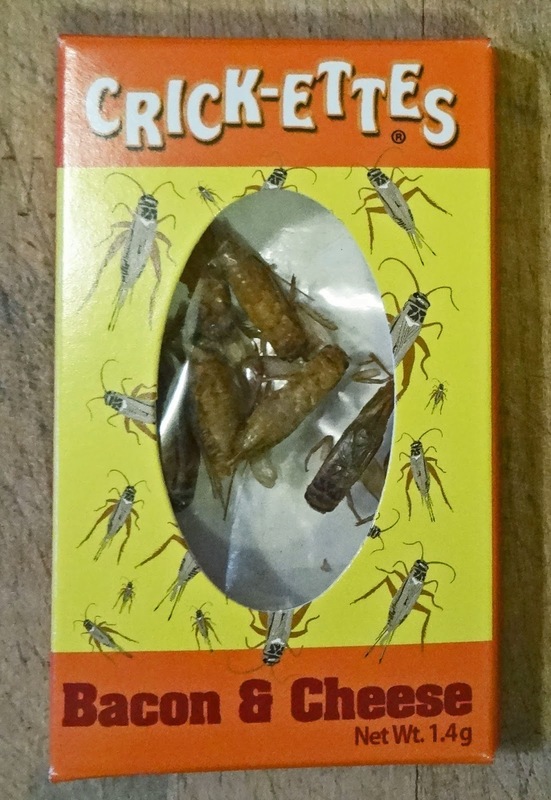 I guess will name the rest of the crickets in the package; No Thanks! Zoomie, So does that mean you do not want any bacon & cheese crickets? Tried the salted Chapulines in Oaxaca, Mexico. Smaller and thus less visually intimidating than these bad boys! Were good though! Kevin Sandridge, Were they good? I will answer that with; they were not bad. It was a texture thing. There was some flavoring on them that was supposed the be cheese and bacon but I was overwhelmed by the texture. I will pass on the rest of the package. Yes, that's exactly what it means. :-) But I admire your fortitude in trying them.